I have seen the question arise quite often lately: "what is your favorite month name?" 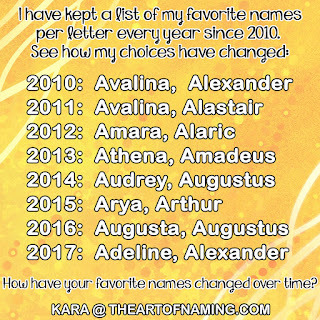 I believe this question is driven solely by everyone's sudden interest in the name August. And as you'll see below, this name has come back to the forefront very quickly after not being seen much since its heyday in 1915. It is also pretty much the only logical boy option and parents are quickly falling in love with it. This first frosty month has been given to baby girls since 1951 in the US. The name was most popular in the late 1970s. It had one big popularity spike in 1978 with 257 births and has fallen out of style since then. There were 26 births in 2012 for a ranking of #5274. 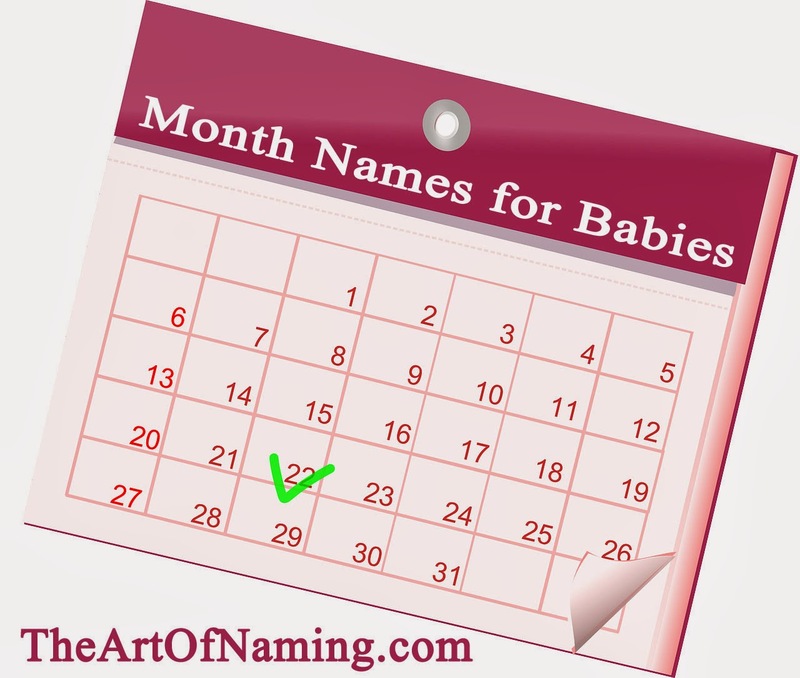 Our shortest month has never had any recorded usage as a name for boys or girls. Parents probably opt to honor St. Valentine instead of the name of the month. Valent- names have had plenty of usage! March is not currently used as a name but it was used in the past. For boys, It was given to 5 babies in 1900 but wasn't seen again until 1916. It was sporadically given to a handful of babies until usage stopped in 1989. Girls received the name most often in the 60s and 70s but it hasn't been seen since 1978. April has been used regularly for girls since 1917. It was even given to boys from 1959 up until 2004. For girls, April had a huge popularity spike in the 70s and 80s. There were at most 11,469 girls given the name in 1980. Today it has fallen to 778 births and a ranking of #396. The lovely May has been a consistently used name since records began in 1880. It is very nearly a classic name, being used often for girls. In 1963, it fell out of the Top 1000 and hasn't gotten close since then. With 106 births in 2012, it ranks at #1883. This name has also been given to a handful of boys nearly every year from 1882 to 1996. This is surprisingly a unisex name, having been given to both genders every year since 1880. However, it is favored overwhelmingly by the girls. 1925 was June's best year with 6,649 feminine births. It has been on a steady decline since then until it began climbing again in the mid 2000s. 2012 had 710 births and ranked at #435. This hot month has never made for a hot baby name despite its similarity to other Jul- names like Julie. It has been used for girls since 1962 but it has never had more than 23 births in a single year, which happened in 2010 for a ranking of #5855. For boys, July has been used since 1989 (except for 5 births in 1973) but the most births in a single year was 12 in 2009. If there ever was a boys' name that followed the 100 year rule, it'd be August. With a grand peak of 709 births in 1915, this name rapidly declined again until modern parents discovered it around 2000. 2012 had the most births ever for the name, 936 for a ranking of #333. I suspect it will only climb higher. Other variations like Augustus (#697) and Augustine (#999) are also doing well. For girls, August has only been used since 1914 and is not nearly as popular as it is for a boy. It gained regular usage in 1963. The most births in a single year was 130 in 2012 for a ranking of #1635. Augusta has been used much more consistently but only received 30 births in 2012. Despite the cute nickname possibility of Toby for a boy, nobody has ever thought to do so. There are no recorded male births for the name October, however, it has been used for girls now and then since 1969. 2008 was her best year with 72 births and a rank of #2603. Since there aren't many month choices for boys, perhaps it can catch on for boys soon along with August. Or I can dream at least. Remember, remember the name of November -- which has only been given to baby girls since 1971 and never to a boy. I suppose it is cuter for a girl if she's called Nova or Ember. Not many agree though. It was only given to 33 girls in 2012, (#4432), which is the most the name has ever seen in one year. In the end, August seems to be the only logical month name to give to a boy with the exception of March and July and my own wishful thinking for October nn Toby. The rest of the months are very girl-dominated. By far, April was the name with the most popularity, reaching over 11k births for its peak. And poor little February gets no love! Which is your favorite month name? Would you ever use one of the months ending in -ber? Let me know your thoughts!